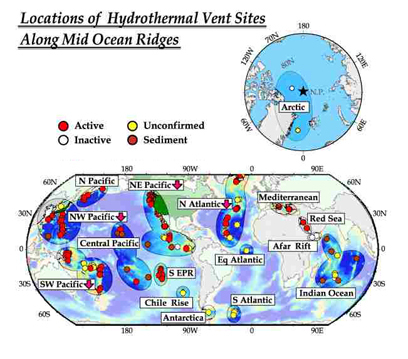 Hydrothermal vents occur at both diverging and converging plate boundaries. Heat is released as magma rises and cracks the ocean floor and overlying sediments. Seawater drains into the fractures and becomes superheated, dissolving minerals and concentrating sulfur and other compounds. When the water is blocked in its downward path it spews forth as a jet of water with temperatures approaching 750° F.
Coming into contact with the cold bottom waters of the deep sea, the dissolved minerals quickly precipitated out of solution and form tall towers or chimneys. Plumes of water stream from these waters, often rising 1,000 ft above the vent. The water of so-called “black smokers” is rich in sulfides; that of “white smokers” contains compounds of barium, calcium, and silicon. The temperature of the plume of white smokers is usually lower than that of black smokers. Water also seeps through the walls of the chimneys and cools enough (35°-210° F) to allow a highly specialized fauna (see below) to live in the vent. Vents usually occur in clusters or wide fields above a given body of magma. More tectonically active plate boundaries (e.g., the East Pacific Rise) tend to have more numerous and denser clusters of vents than less active (e.g., the Atlantic Mid-Oceanic Ridge) locations. Vents are temporary features on the seafloor. They become inactive when seafloor-spreading moves them away from the rising magma or when they become clogged. Some vent fields may remain active for 10,000 years, but individual vents are much shorter-lived. Chemosynthetic bacteria obtain energy from the chemical bonds of hydrogen sulfide. 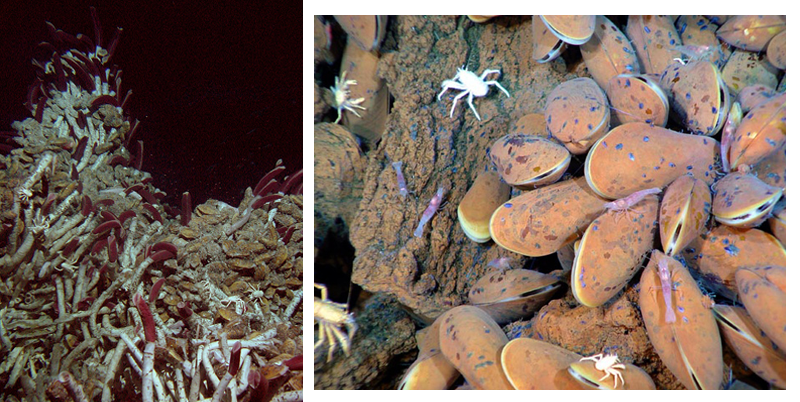 In hydrothermal vent communities, these bacteria are the first step in the food chain. Many of these bacteria exist in symbiotic relationships with species in the vent fauna. They are hosted by vestimentiferan tubeworms, vesicomyd clams, and bathymodiolid mussels. The tubeworms have no gut at all and depended completely on the bacteria living in their tissues. Vent tubeworms range in size from less than an inch to almost 3 ft long. The largest, Riftia pachyptila, lives on the East Pacific Rise. The bivalves are filter-feeders as well as recipients of energy from symbiotic bacteria. Clams have reduced digestive systems, indicating a greater dependence on the chemosynthetic microbes than mussels, which have fully functional digestive systems. The giant vent clam (Calyptogena magnica) can reach a length of nearly 8 in. There are shrimps that also host sulfur-dependent bacteria. At least some “farm” the bacteria on specialized mouthparts. 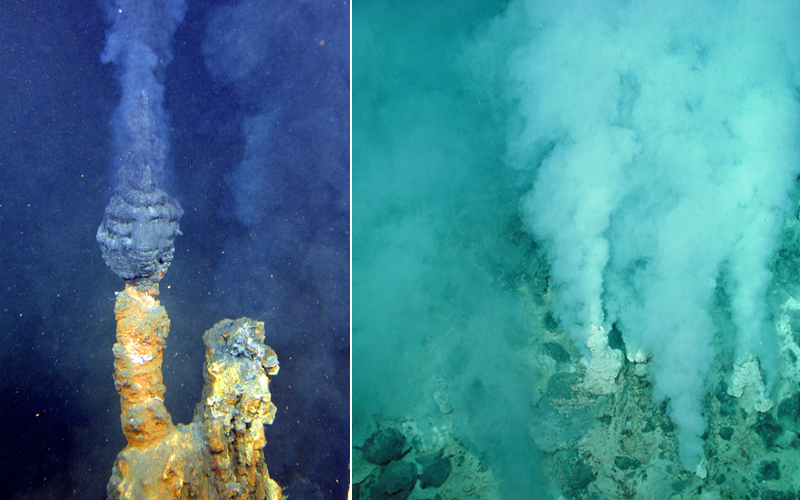 In addition to bacteria living in hosts, there are also free-living chemosynthetic bacteria living at vents. Some live as small blobs resembling marine snow within the rising plume. Others grow as mats or biofilms on hard rock or animal surfaces and are grazed by copepods, amphipods, and shrimps. Top carnivores at vents include the eel-like zoarchid fish, which apparently feeds on snails, limpets, and amphipods. Vent crabs and squat lobsters prefer clams and tubeworms. These animals are all restricted to vent habitats. More widely distributed octopuses visit the vent to feed on clams and mussels. Scavengers (gastropods, decapods, and copepods) arrive when the vent community is in decline because the vent itself is clogged or its activity is declining as the vent moves away from the magma source.